When Christopher Hampton discovered the epistolary novel Les Liaisons Dangereusesas a young French student at Oxford University in the 1970s, the work and its author, Pierre Choderlos de Laclos, were largely unknown to the English speaking population. Written and published in the decade leading up to the French Revolution, this masterful work was written by Laclos around his day job as a military officer. Despite a small number of poems, essays and stories from his collection surviving, it is for Liaisonsthat he is best known. While the timing of the work (a decade before the revolutionary uprisings in France) and its content make it tempting to view Liaisonsas a politically motivated work, commenting on the lascivious behaviour and decayed morals of the French aristocracy, Laclos' bourgeois upbringing and the novel's popularity among the upper classes make this uncertain. However, as Laclos wrote the novel in 1780 and had it published two years later, a mere seven years before the storming of the Bastille and the march on Versailles that occurred in 1789, his commentary on the aristocracy is a snapshot of a world and a class of people that was soon destroyed. Little is known about Laclos or his motivations for writing Liaisons, which was largely crafted during a six-month period of leave spent in Paris, and was considered to be scandalous when it was published. Laclos had a long career in the French military, and he wrote numerous poems and a small number of novels as he travelled around to various postings around the country. After balancing the two careers for some time, and finally finding success with Liaisons, Laclos left the military to become secretary for the Duke of Orleans and later the Ministry of War. After two jail stints for his political alliances, and failed attempts to found a bank and launch a new career as a diplomat, Laclos met Napoleon Bonaparte (who was then aged in his late 20s) and became one of his supporters. He eventually returned to the military for a short time at the end of his life before dying of dysentery in Italy in 1603 at the age of 61. 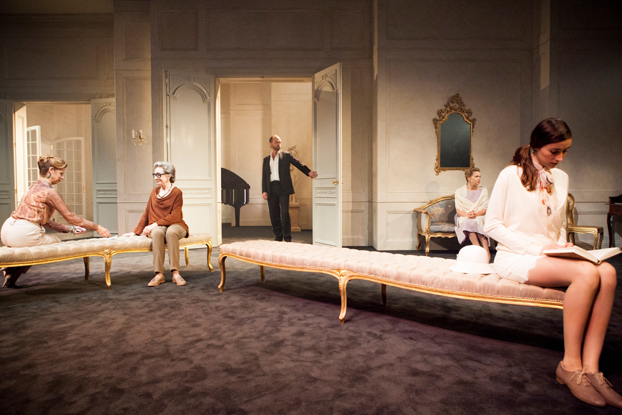 Les Liaisons Dangereuses, Wharf 1 Theatre, 31 March - 9 June, 2012.